فرایندهای تغییرشکل پلاستیک شدید از جمله فرایندهایی هستند که در چند دهه اخیر بسیار مورد توجه محققین واقع شده‌اند. در تغییرشکل‌های پلاستیک شدید کرنش اعمالی مقدار بالاتری نسبت به فرایندهای معمولی تغییرشکل دارد که بسته به نوع تغییرشکل این مقدار متغیر می باشد. اکستروژن برشی ساده (SSE) و نورد تجمعی (ARB) از جمله فرایندهای تغییرشکل پلاستیک شدید برای دست‌یابی به ساختارهای نانومتری هستند. در پژوهش حاضر به منظور تکامل ساختار، ایجاد ساختار ریز دانه، بهبود و افزایش استحکام و سختی، مس خالص تجاری تحت فرآیند ARB و SSE قرارگرفت. تعداد پنج پاس نیروی پرس و هفت مرحله نورد تحت شرایط یکسان در دمای محیط بر نمونه ها اعمال گردید. پس از تهیه نمونه‌های فرآوری شده با استفاده از دو روش فوق، آنالیز ساختاری و مکانیکی در مراحل مختلف فرایند به منظور بررسی خواص انجام شد. خواص مکانیکی نمونه-های استاندارد تهیه شده با انجام آزمون‌های سختی و کشش ارزیابی شد. آزمایش‌ها نشان دادند که سختی، تنش تسلیم و استحکام با افزایش مراحل ARB و SSE بطور چشمگیری افزایش می‌یابند. همچنین نتایج بیانگر آن بود که نمونه‌های فرآوری شده با استفاده از روش ARB از لحاظ مشخصات ریزساختاری و رفتار مکانیکی دارای خواص بهتر و بارزتری نسبت به روش SSE می باشد. ساختار لایه‌ای نیز با استفاده از میکروسکوپ نوری بررسی شد. Techniques of severe plastic deformation have been of continual interest in the production of novel metallic microstructures. Among these, accumulative roll bonding and simple shear extrusion have been extensively used in modern industry. In severe plastic deformations, applied strains have higher values than usual forming methods. Accumulative roll-bonding (ARB) and simple shear extrusion (SSE) processes are two severe plastic deformation processes capable of developing nanostructures. In this research, pure commercial copper was processes with ARB and SSE processes to obtain nanostructure and improve its structure, strength and hardness. Five passes of extrusion and seven passes of rolling were applied on the specimens with the same conditions. After preparing the specimens using both methods, mechanical and structural analyses were performed to evaluate the properties. Mechanical properties were measured using standard tensile and hardness tests. The results show that hardness, yield strength and ultimate tensile strength of the extruded and rolled specimens are increased by increasing the number of cycles. It was concluded that mechanical and structural properties of the specimens produced under ARB conditions appear to be better than SSE process. The layers structures were also studied by optical microscopy. اسلامی، امیرحسین، مشکسار، محمدمحسن، زبرجد، سید مجتبی. بررسی خواص مکانیکی و مغناطیسی کامپوزیت لایه ای مس- نیکل تولید شده به روش اتصال نورد تجمعی (ARB). فصلنامه علمی - پژوهشی مواد نوین، 1392; 4(12): 89-103. اسلامی، امیرحسین، زبرجد، سید مجتبی، مشکسار، محمدمحسن. بررسی رفتار ساختاری، مکانیکی و الکتریکی کامپوزیت لایه ای مس تولید شده به روش اتصال نورد تجمعی(ARB). فرآیندهای نوین در مهندسی مواد، 1394; 9(1): 1-7. اسلامی، امیرحسین، مشکسار، محمدمحسن، زبرجد، سید مجتبی. بررسی اثرات ذرات تقویت کننده اکسیدآهن (Fe3O4) بر رفتار مکانیکی و مغناطیسی ماده مرکب زمینه مس تولید شده به روش اتصال تجمعی نورد. فرآیندهای نوین در مهندسی مواد، 1393; 8(1): 51-60. اسلامی، امیرحسین، مشکسار، محمدمحسن، زبرجد، سید مجتبی. بررسی اثرات ذرات دی سیلیساید مولیبدن(MoSi2) بر رفتار مکانیکی و الکتریکی ماده مرکب زمینه مس تولید شده به روش اتصال نوردی تجمعی (ARB). فصلنامه علمی - پژوهشی مواد نوین، 1392; 4(شماره 13): 57-68. اسلامی، امیرحسین، حسینی، سید هادی، کازرونی، افشین. بررسی و مقایسه خواص مکانیکی مس خالص تولید شده به دو روش اتصال نورد تجمعی(ARB) و آهنگری چند محوره (MAF). مهندسی متالورژی، 1394; 18(57): 54-62. نخودچی، سهیل، محمودی، محمد، شکوه فر، علی. یک فرآیند جدید تغییرشکل پلاستیک شدید بر مبنای برش ساده و برش خالص. مهندسی مکانیک مدرس، 1395; 16(4): 145-154. A. H. Eslami, S.M. Zebarjad, M.M. Moshksar, “A study on the mechanical and magnetic properties of Cu/Ni multilayer composite fabricated by Accumulative Roll Bonding process (ARB)”, Materials Science and Technology, Vol. 29, pp. 52-64، 2013. Y. Saito, N. Tsuji, H. Utsunomiya, T. Sakari, R.G. Hong, “Ultra-fine grained bulk aluminum produced accumulative roll-bonding (ARB) process”, Scripta Materialia, Vol. 39, pp.1221-1227, 1998. N. Tsuji, Y. Ito, Y. Saito and Y. Minamino, "Strength and Ductility of Ultrafine Grained Aluminum and Iron Produced by ARB and Annealing", Scripta Materialia, Vol. 47, pp. 893-995, 2002. L. Ghalandari and M. M. Moshksar, "High Strength and High Conductive Cu/Ag Multilayer Produced by ARB", Journal of Alloys and Compounds, Vol. 506, pp. 172-178, 2010. Beygelzimer, Y., Orlov, D., Korshunov, A., Synkov, S., Varyukhin, V., Vedernikova,I., Reshetov, A., Synkov, A., Polyakov, L., Korotchenkova, I., "Features of Twist Extrusion: Method, Structures & Material Properties", Solid State Phenomena, Vol. 114, pp. 69-78, 2006. A. P. Zhilyaev, T. G. Langdon, "Using high-pressure torsion for metal processing:fundamentals and applications", Progress in Materials Science, Vol.53, Issue 6, pp. 893-979, 2008. R.Z. Valiev., and T.G. langdon., "Principles of equal-channel angular pressing as a processing tool for grain refinement", Progress in Materials Science, Vol.51, pp. 881–981, 2006. Bagherpour, E., Qods, F., Ebrahimi, R., & Miyamoto, H., Microstructure quantification of ultrafine grained pure copper fabricated by simple shear extrusion (SSE) technique. Materials Science and Engineering: A, 674, 221-231, 2016. Bagherpour, E., Reihanian, M., & Ebrahimi, R., “On the capability of severe plastic deformation of twining induced plasticity (TWIP) steel”, Materials & Design, Vol. 36, 391-395, 2012. Bagherpour, E., Ebrahimi, R., & Qods, F. (2015). An analytical approach for simple shear extrusion process with a linear die profile. Materials & Design, 83, 368-376. Pardis, N., & Ebrahimi, R. (2010). Different processing routes for deformation via simple shear extrusion (SSE). Materials Science and Engineering: A, 527(23), 6153-6156. 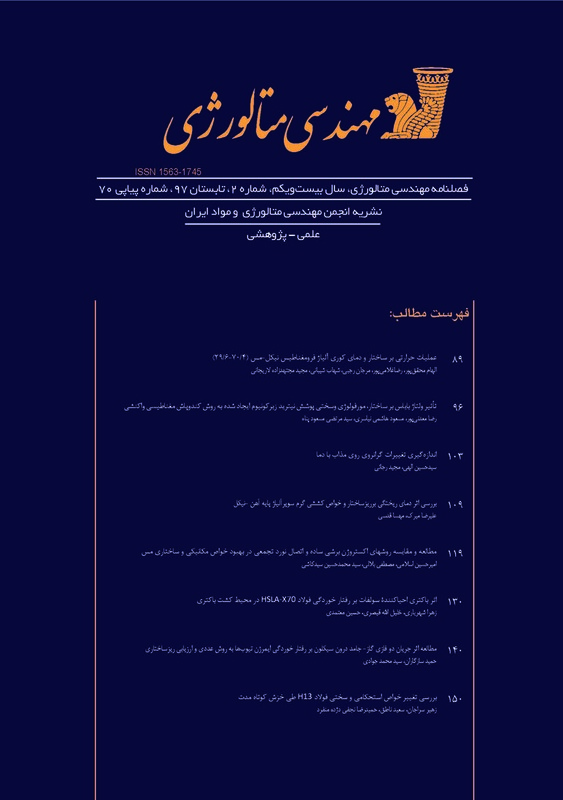 Bagherpour, E., Qods, F., &Ebrahimi, R. (2014). Effect of geometric parameters on deformation behavior of simple shear extrusion. In IOP Conference Series: Materials Science and Engineering (Vol. 63, No. 1, p. 012046). IOP Publishing. Dmitry Orlov, Yan Beygelzimer, Sergey Synkov, Viktor Varyukhin and Zenji Horita, "Evolution of Microstructure and Hardness in Pure Al by Twist Extrusion", Materials Transactions, Vol. 49, No. 1, pp. 2 – 6, (2008). Tork, N. B., Pardis, N., &Ebrahimi, R. (2013). Investigation on the feasibility of room temperature plastic deformation of pure magnesium by simple shear extrusion process. Materials Science and Engineering: A, 560, 34-39. M. Richert, H.P. Stuwe, M.J. Zehetbauer,” Work hardening and microstructure of Al-Mg after 5 severe plastic deformation by cyclic extrusion and compression”, Materials Science and Engineering A, Vol. 355 (2003), pp. 180-185. R. Z. Valiev, and T. G. Langdon, “Principles of equal-channel angular pressing as a processing tool for grain refinement”, Progress in Materials Science, Vol. 51(2006), pp. 881-981. Salishchev G, Zaripova R, Galeev R, Valiakhmetov O, 2005, Nanocrystalline structure formation during severe plastic deformation in metals and their deformation behavior. Hosseini, S. A., &Manesh, H. D. (2009). High-strength, high-conductivity ultra-fine grains commercial pure copper produced by ARB process. Materials & Design, 30(8), 2911-2918. C. Lu, K. Tieu and D. Wexler, “Significant enhancement of bond strength in the accumulative roll bonding”, Composites, Vol. 26, pp. 145-156, 2008. J. Abenojar., F. Velasco and M. A. Martinez., “Optimization of processing parameters for the Al %10 B4C system obtained by mechanical alloying”, Journal of Materials Processing, Vol. 328, pp.222-229, 2008. J. Young Hwan, K. Sang shik and H. Seung- Zeon, "Tensile Behavior of Commercially Pure Copper Sheet Fabricated by2- and 3- Layered Accumulative Roll Bonding (ARB)Process", Metals and Materials International, Vol. 14, pp. 171-179, 2008. Shahbaz M, Pardis N, Ebrahimi R, Talebanpour B, 2011, A novel single pass severe plastic deformation technique: Vortex extrusion, Materials Science and Engineering: A, 530, 469.